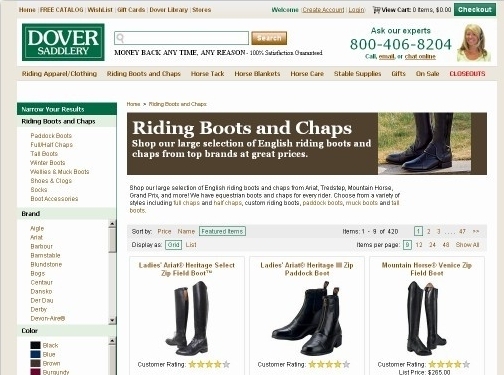 Shop Dover Saddlery"s large selection of English riding boots for the latest equestrian footwear. 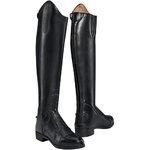 Choose from paddock boots, tall boots, and other equestrian boots for English riders. The ladies" Ice Rider tall boot from Mountain Horse features heavy-duty zipper, insulation and waterproofing for all-weather riding. These Tredstep Deluxe Leather Half Chaps are popular for their stretch leather panel, comfortable fit and durability for every day use. The Mountain Horse Venice Zip Field Boot is a fashionable riding boot featuring a slim design and sleek look. The full-length zipper makes these boots easy to get on and off. US (Littleton, MA) based company - established in 1975 - providing riding boots for sale. Website includes e-commerce facilities, shipping and returns information, full company contact details.